I'll start first with a question about oil change. Is it easy to change the oil and filter without taking off the muffler. It looks like theres more room to get the socket on the oil plug but i haven't tried it yet. Any info or comments welcome .. I don't have either, but I have the 3 valve engine. Get a six point 24mm wrench and you'll be good to go. I am a little bummed that the variator tools I bought for my leader 150 are not going to work for the new sprint.... on the upside at least the oil filters are the same. This question is about mirrors. The Sprints mirrors are attached on a ball bearing. You basically move the mirror into the desired place and they should stay in place. On my right mirror it keeps moving out of it's set position. Does anyone know how too lock it in place? 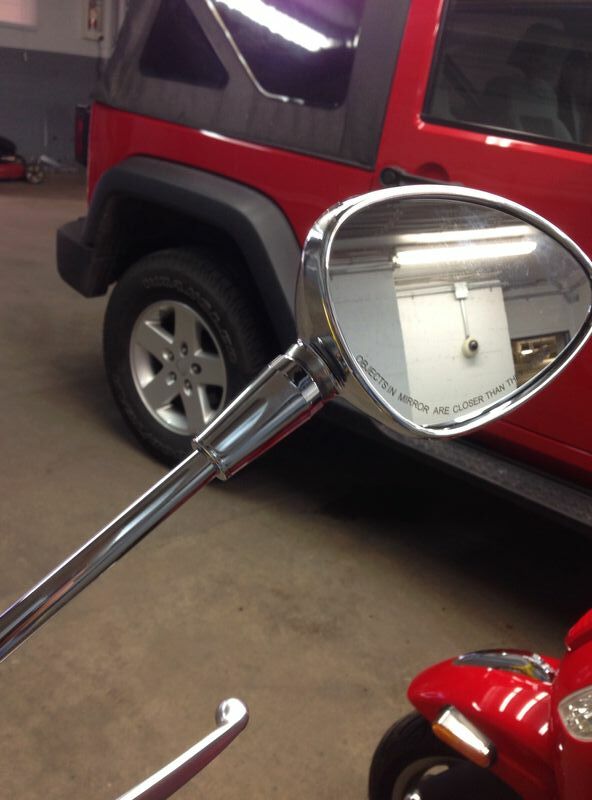 Ever thought about switching to handlebar end mirrors? Works for LX and GTS already. I really don't want to change anything from stock. Actually the mirrors are really good and give you a good picture of what's beside and behind you. Turns out that if the (for lack of a better word) ball bearing at the end of the handle holding the mirror does not hold itself in a proper postion , guess what ? Your screwed ! You have no choice but to get a new mirror. There is no way to lock the mirror portion in place. Luckily mine was replaced under warranty but this will be a common issue as it was made like ( as my german friends would say , like Shizer ! Turns out that the placement of the oil fill plug is now on the muffler side of the scoot. That in itself is not an issue , G0d bless the Italians ! The angle to top up or refill is at a ridiculous angle. Does anyone have a good tip on what to use to make this simple task an adventure ? Well the replacement has the same problem as the first mirror. They are made like crap. Have to go back to the dealer again ... this is really annoying. You can get an Craftsman wobble extender, an 1/2" to 3/8" drive adapter and then you can use an torque wrench without removing exhaust pipe. Needed adapter as I couldn't find an 24mm socket in 3/8" drive. Just by luck I was riding today and saw a MAC Tool truck sitting outside a car dealer. I found a 3/8" 24mm socket. 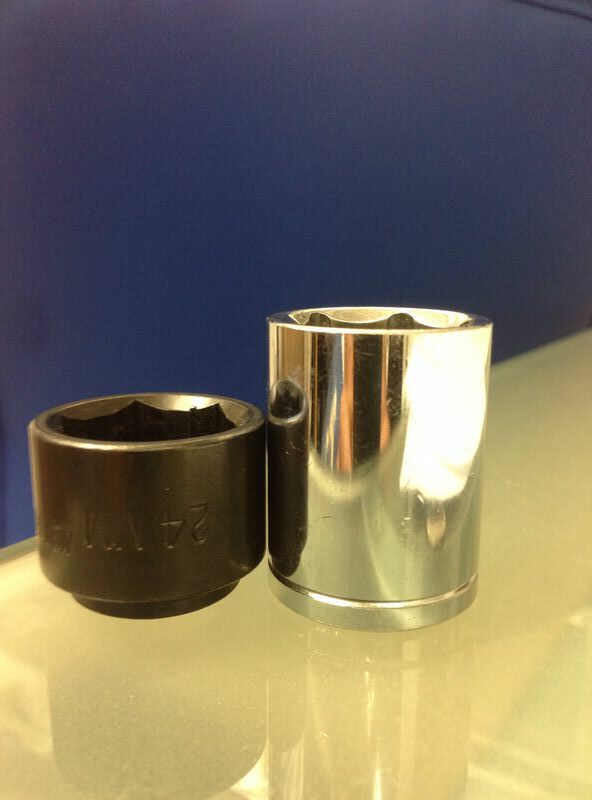 It's almost 1/2 the height of a regular 24mm socket. This extra room to work allows me to use a 3/8" swivel with it comfortably. Here's a pic... MAC TOOLS are sold all over North America. A bit pricey but in this case worth it. 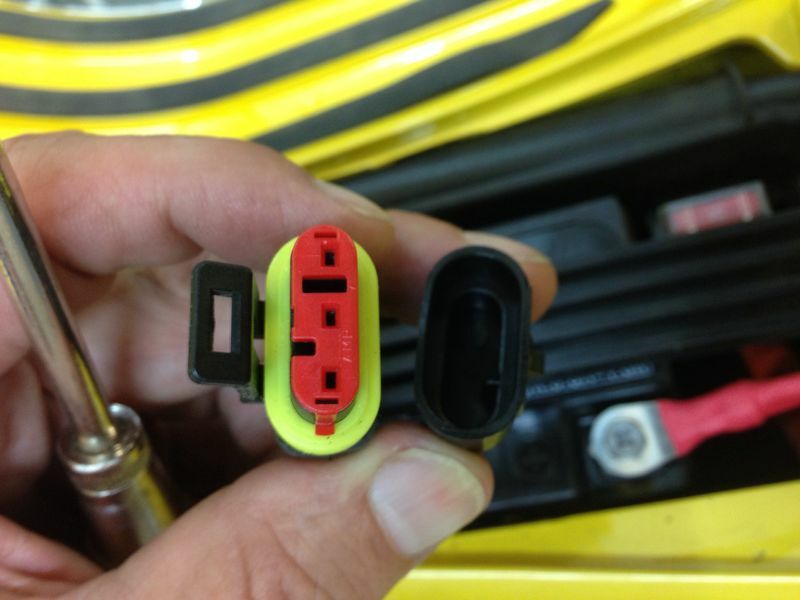 Quick question: I just bought my first Vespa (new black 155cc Sprint) and I was adjusting the pre-load. I may be mis-reading the manual. In the attached photo, I believe I've set the rear shock pre-load to "4", or maximum, for "rider + passenger". Is this correct? Thanks for your help. 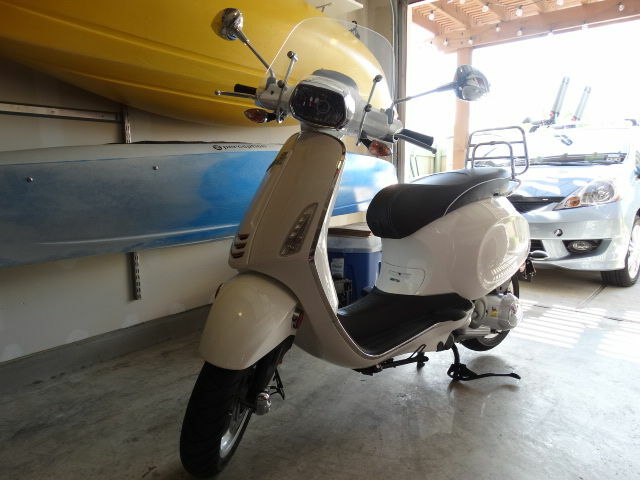 Love the scooter by the way, and this forum is fantastic. I believe you maxed it out ... For that setting its best two up riding and some baggage... that's very stiff especially if your roads are not like a mirror. 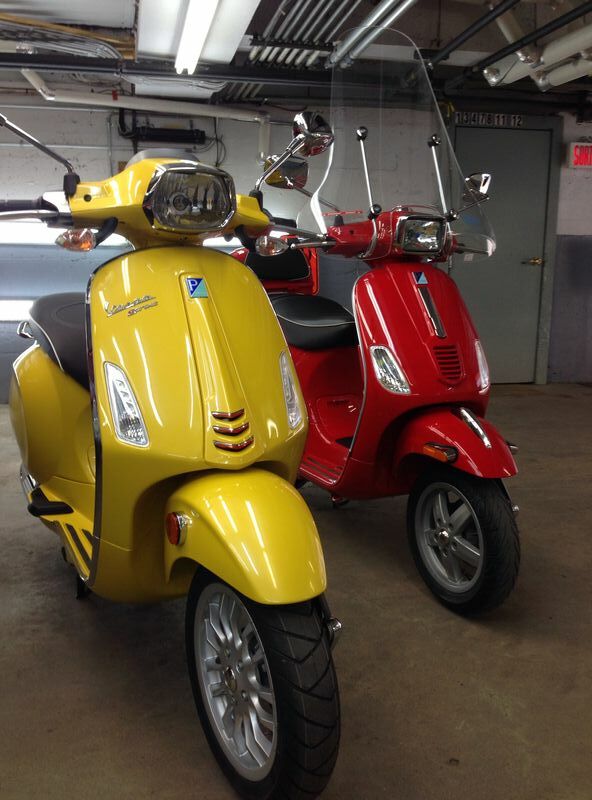 Congrat's on you new scoot. I love mine. Just did the first service and am ready to go WOT anytime now. Thanks kdude for the quick reply. I liked your write-up on the Sava MC16's as found on the Sprint. I don't have anything to compare them to, so it was helpful. 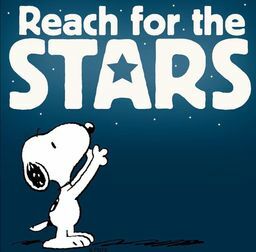 I only have around 300km on the Sprint, so can't go WOT yet... but soon! Anyone know what it's used for? another awesome little improvement over the last gen lx , s series is the air valves. 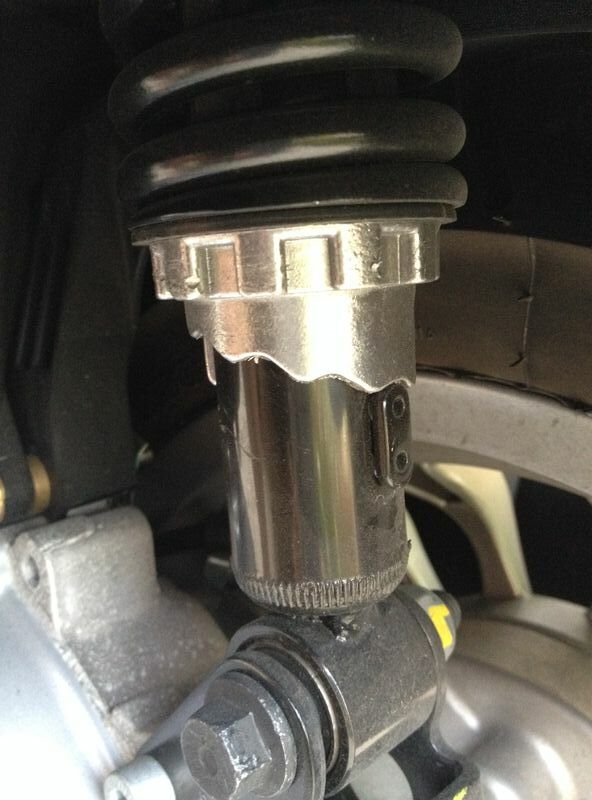 It is so much easier now to check the air pressure and to add or release some air from the tires. Got any pics of your sprint kdude? yes, that is the diagnostic connector for hooking up to the dealer computer. On the lift getting ready for 1st service ! Just had my first oil change at just over 1000 KM. It's strange but the engine vibrates a little more the harder I brake. The riding season will come to an end for me around the end of September. In the spring, will I need to get the oil changed again when I start riding? I may add 250 km between now and then. I noticed that too at a dead stop. We both have roughly about the same km's on our scooters. I'm pretty sure the motors will get smoother as time goes by. My riding season is similar to yours though if i had the right equipment i would push it till it snows or gets so cold its just not fun anymore. Does TO have the large screen and Top box in stock ? We have almost nothing yet for accessories. The strange issue has only happened since I got the oil changed and only when braking hard while stopped. Otherwise, I am very happy with my Vespa and only use premium fuel. I pre-ordered my Vespa Primavera with the top case so it was all available at once. I think you can get most of the accessories here from our local dealer. 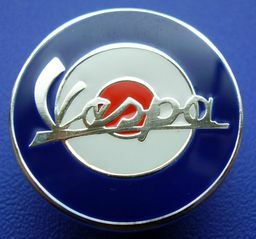 They have a great selection of Vespa accessories and other gear. I have not yet embraced the idea of a windscreen. Today it was a modular helmet and warm gear day. Should be closer to 25, not 15! Very impressed with the web site, selection and prices. Next time i'm in TO to see my sister i'm going to drop in and check it out. Thanks for the lead. Its way easier to fill the gas tank. For some design reason when you get close to topping up the pump stops just short of overflow and its easier to take a look inside the tank to see how full the tank is. Another design improvement that hasn't been mentioned. Kudos to Piaggio. 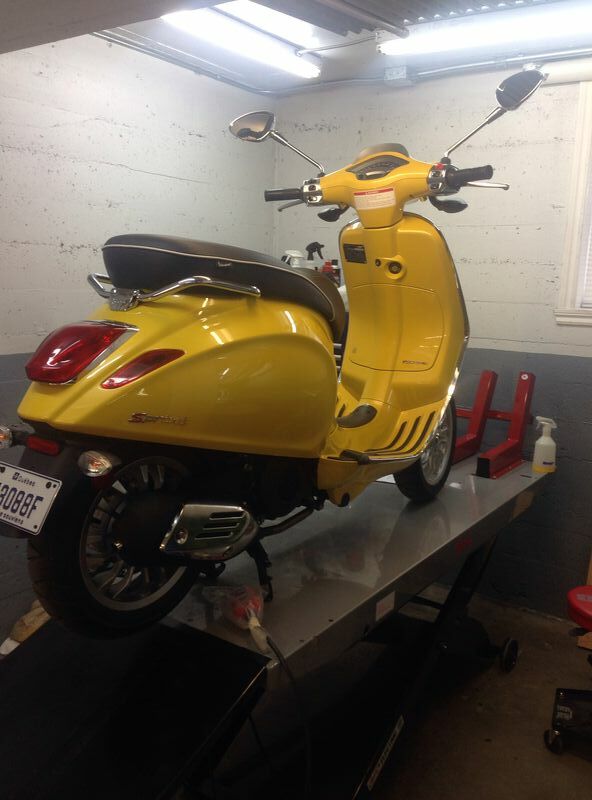 Lots of little changes that have made this scoot the best vespa that has come to market. Its about the ABS system. Piaggio decided that the best way to tell the rider that the system is working properly is at "stop" it blinks non stop. 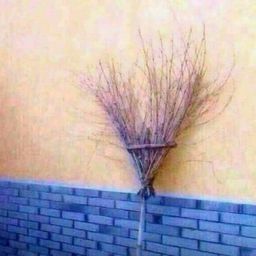 It always catches my eye and is a major pita ! It would have been better if the ABS system was in a "fail mode" a light would turn on to worn the rider not the other way around. Just wondering whether any other Primavera riders can advise whether I need to get my oil changed again next spring. I just had the 1000 KM service completed at the dealer. I'll probably do another 500 KM before I put it away for the winter. According to the manual, the next oil change is not until 10,000 KM (6213 miles). However, many people advise that oil should be changed every spring. Thoughts and recommendations? The next scheduled maintenance services (according to the manual) are inspections of the electrical system and battery, brake fluid, oil level, brake pads, tire pressure and wear and road testing at 5000 KM (3106 miles). Any advice? Thanks. On several of my scooters I did it both ways .... some i changed beginning of the season and others i did not. There was absolutely zero difference between the 2 methods. This is my take on this. 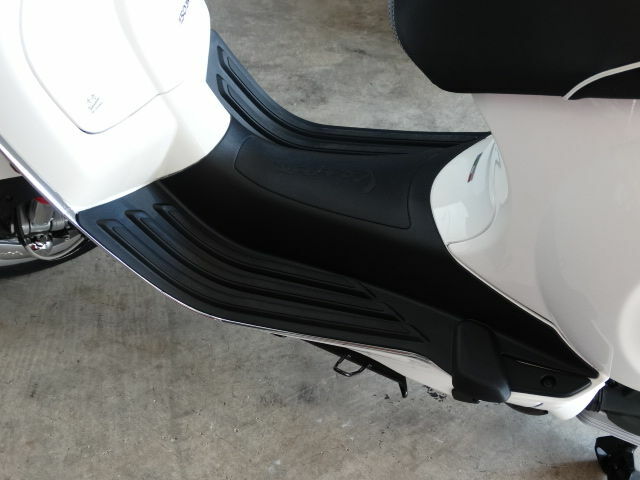 If you store your scooter in a dry , heated garage I would just change it at the specified intervals. Oil won't go bad after a few months in storage in a dry , heated storage. If i'm bored in the spring and i feel like working on my scooter I may change the oil just for the heck of it but i doubt if there advantage to doing it. I noticed in a few video's that the Asian (vietnam version) of the 150 has a locking / opening mechanism on the seat. I was surprised to see this difference and was wondering why that is.. Anyone know the ans ? You found a screen that fits the non round headlight? Quorray congrat's on your new Sprint ... couple of pics would be nice to see. Ok.. I'm stoked that you ordered the Akro exhaust. I've been thinking about that upgrade a lot lately. Looking forward to your ride report after you have installed it. The weight saving in itself is a big benefit. Your spot on the front headlight is dull and the light reflecting doesn't match those beautiful leds ... The Piaa should do the trick but maybe do a bit more research and check out the Xenon H4 bulbs from Phillips. Also look at this wonderful post by Jimson , He really is a step ahead of any of us in na with upgrades to his Sprint. Let me know how your mods work out , i'm right behind you. 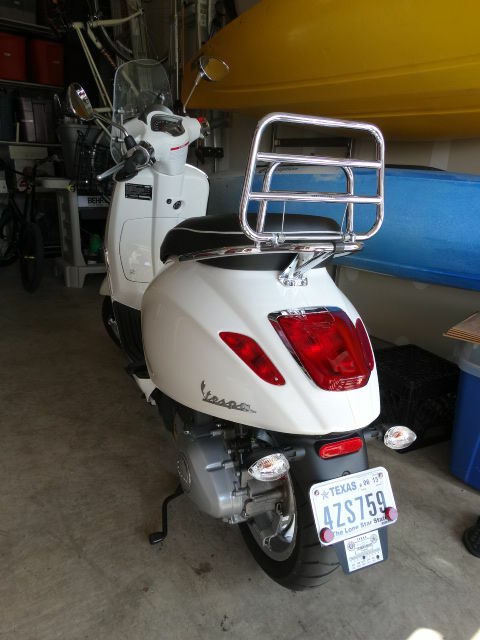 I'm excited that there's a thread that shares about the new Vespa that's for sure. I installed the Piaa and it made a big difference, the light is brighter and fans out more. Was it worth the money... sure if it makes a difference and it did. I'm going to take a look at your suggested H4 option in the future. Rich11111 the Vespa fly screen came from AF1 racing in Austin Texas where I live, those guys are awesome. I added the Vespa side kick stand also, not really worth it in my opinion as it has a really stiff spring and if you use it all the top your Vespa might fall over. Kick stand just goes up if there's no pressure on it. Plus side of added the side stand is it really makes changing the oil really easy, when I changed it the first time oil ran down the center stand. Besides the exhaust the only performance item I will get in the future is a possible ECU flash from AF1 when available. Those guys do incredible stuff to bikes down in New Braunfels. Look forward to seeing what everyone is doing to their Sprint/Primavera.